Once upon a time a retailer could offer products with a generalist, one-size-fits-all approach. Foodservice operators could present the same menu across their entire network. Banks could offer the same products and services at every branch. Apparel stores could stock whatever fit into their store. And people would buy. As anyone in the retail industry knows, this is no longer the case. Not only do retailers need to be location-specific with their merchandise and product assortment, but they need to ensure the products are well chosen and well presented. The curation of a product assortment is critical for the success of bricks-and-mortar stores, but the presentation of that assortment is equally important. We asked some of our design team to comment on their tips for best-in-class merchandising strategies – here is their advice. Sunhee Im, Designer of Branded Environments, doesn’t always think less is more – she believes the story the brand wants to tell has to be compelling. One example she cites where the product itself was used as a design element with a “more is more” approach is American Apparel, where the product was organized by color and style in a minimal white space. A lesser known example she loves is Allbirds, a shoe store that tells a very specific story about the kinds of shoes it sells. The environment is more like a museum than a shoe store, featuring a narrative about “the world’s most comfortable shoe.” The minimalist design features tactile, visually intriguing samples of the materials used to construct their product: wool, trees and sugarcane. A very limited sample of the shoes are on display, exclusively on the wall. However, a great deal of wall space is dedicated to story-telling elements. The center of the store features only simple, contemporary seating for people to sit while trying on the shoes. The slightly lower seating leaves a wide open feeling, allowing the wall with story and product to be the entire focus. L’Occitane En Provence recently opened an experiential store on 5th Avenue in New York that takes customers to Provence with live olive trees, a large rain-shower basin, and yellow and white bicycles great for social media friendly images. There’s even a VR balloon ride through lavender fields and a section of the store is a tiny replica of a small French village. Again, a greater portion of the space is dedicated to the story than the product. There is an enormous attention to tactile, hands-on experiences that evolve through seasons and campaigns. A third wonderful example is Japanese homeware and gift shop Corazys. 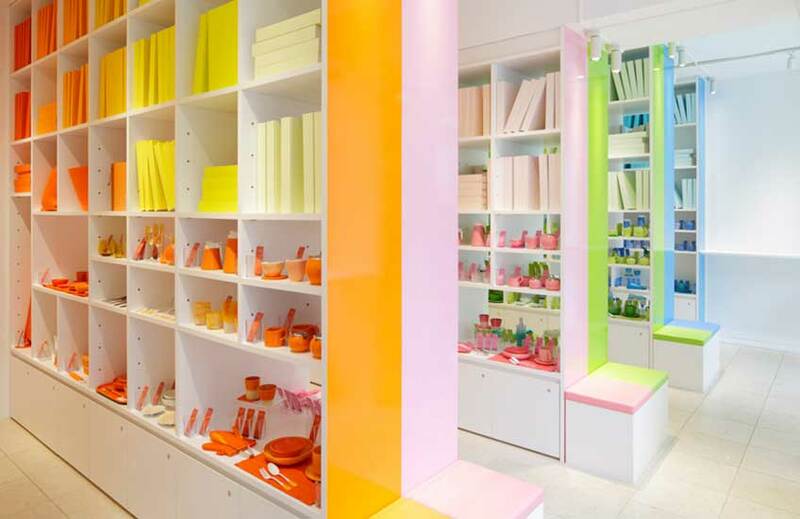 The entire store is color-coordinated and the store design uses blocking beautifully to showcase the solid color products. The strong, simple visual effect is remarkable. Think of your store as a little mini vacation for consumers – where do you want to take them? The NBA finals? A master chef’s dream kitchen? An Italian seaside town? Use the product as a design element. Color is a powerful but simple way to create a unique merchandising story. How can you showcase your products in a more experiential way? 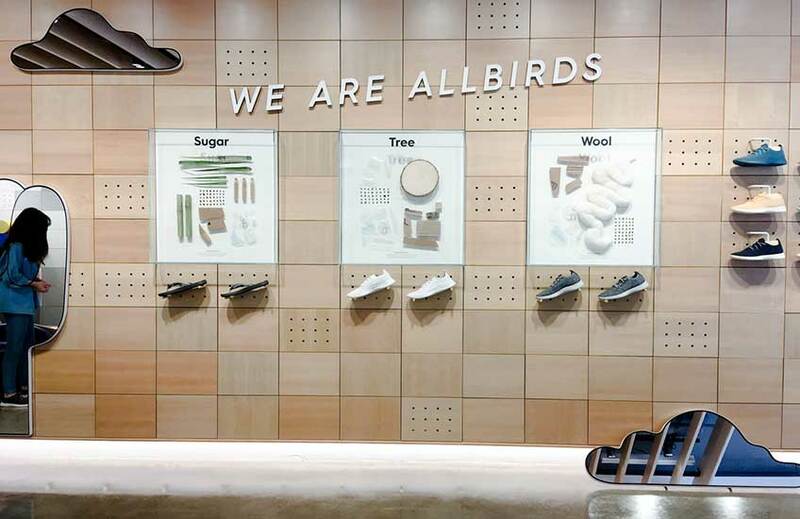 For example, Allbirds uses the product materials to create a sensory experience that supports their overall story of simple, eco-friendly products. Commit to your story. Clear away anything that detracts. As retail brands become more specific and detailed with their product curation and presentation, we will see more inventive, story-based merchandizing that carefully places products within contextual environments rather than just on shelves. It’s an exciting opportunity for brands to be imaginative with their physical environments – and those who do it well will win big.